Whilst the show may be over (for now) Caggie is busy ironing out the final details of her very own clothing line, ISWAI (It Starts With An Idea). Stay tuned for lots more info. In the meantime, what a finale it was…. From Gabriella’s indiscretion to Millie’s mega-speech (haven’t you always wanted to do that??) it were a reet gripping climax. The dresses at the 20s party were indeed roaring, but most of the enquiries I’ve had are about the lovely, cuddly jumper Caggie was wearing during the episode. Now don’t hate her, but Caggie is managing to make a boy’s jumper look that good. 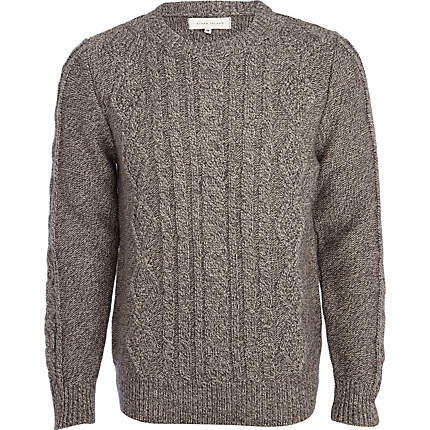 Her grey marl, cable front chunky knit is borrowed from her friend and manager Will *waves hello to Will* and it costs just £36.99 from River Island. Said knit is available in sizes XXS to XXL so you could either buy a teeny version for yourself, or treat your man for Crimble and borrow it for chilling out purposes. And talking of River Island, tonight’s the night for my gold sequin maxi dress (as seen in Vogue and that) to come out of the closet for the James Bond themed party I’m going to. There will be bubbles, there will be a group of friends, there will definitely be a microphone. Now all I need is a crushing revelation to bust out on stage, a la Millie. Hhmmmmm, let’s see…. Screen grabs from 4oD. Product images from River Island. The Bachelor UK: It’s the final! Had a sneaky feeling the jumper was a man’s, it’s very grandad-esque. Love it though! I found a cream one in the charity shop, great find! I asked the question above and have had no response.. Do you have any idea? So sorry Kate – I only write the blog for fun and much as I love answering everyone’s comments / questions when I can, it’s not always so easy with work & being a mum etc! It’s also hard sometimes to pin down the various managers to ask exactly where things came from. Caggie borrowed her dress from a PR agency and I do have the name so I will try my best to email them when I can and find out who they represent. I have already asked Cheska where she got her vintage outfit from and am waiting for her to reply. 1920s stuff is quite hard to get hold of but have a peek at Lovely’s Vintage Emporium because she often has nice 20s stuff. I can suuggest some other vintage boutiques if that would help? Really appreciate everyone taking time to comment and sorry I can’t always answer your questions – in an ideal world I would only write the blog and be able to find out everything, ever!